489. Vertical bucket paddle-wheel. The buckets, a, a, are pivoted into the arms, b, b, at equal distances from the shaft. 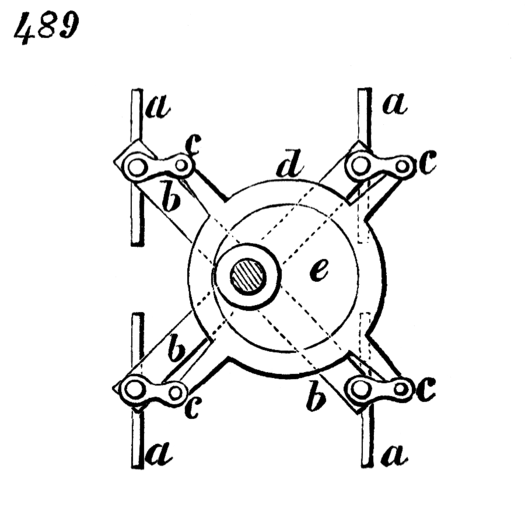 To the pivots are attached cranks, c, c, which are pivoted at their ends to the arms of a ring, d, which is fitted loosely to a stationary eccentric, e. The revolution of the arms and buckets with the shaft causes the ring, d, also to rotate upon the eccentric, and the action of this ring on the cranks keeps the buckets always upright, so that they enter the water and leave it edgewise without resistance or lift, and while in the water are in the most effective position for propulsion.